“Basic Instinct” screenwriter Joe Eszterhas says Donald Trump is an “a–hole,” but that won’t stop him from casting his ballot for the Republican presidential nominee come November. Eszterhas has launched the website JoeUnchained, in which he weighs in on current events and offers screenwriting tips. In a recent post, Eszterhas named Trump “A–hole of the Week” after the GOP candidate mocked a New York Times reporter with a disability. But Eszterhas, whose screenwriting credits also include “Showgirls” and “Flashdance,” echoed many of the convention’s speakers, saying he simply doesn’t trust Hillary Clinton. That mistrust dates all the way back to Bill Clinton’s presidency in the 1990s. “I think we’re dealing with low-lifes and sleazebags,” he said. 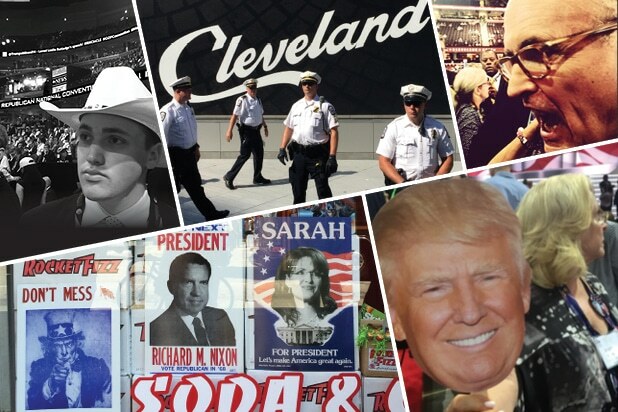 Trump cutout and Cleveland police. Ivanka Trump escorts her father onto the stage to deliver his acceptance speech. Trump supporters, restaurant window, Cleveland. Donald Trump minutes after Ted Cruz's convention speech in which the Texas senator failed to endorse the GOP nominee. Former New York City mayor Rudy Giuliani arrives on the convention floor before speaking to the crowd. Ivanka Trump introduces her father at RNC on Thursday night. An unidentified Code Pink activist is taken into custody after setting fire to an American flag during a protest on Wednesday. Flag burned during protest outside the Republican National Convention on Wednesday. Donald Trump delivers his acceptance speech Thursday night at the RNC. A woman carries a Donald Trump hand fan on the convention floor. Sen. Jeff Sessions, one of the first people to support Donald Trump, on the floor at the RNC. Hanif Phelps, protester, outside the RNC Wednesday. Conservative radio and TV host Sean Hannity on Monday, first night of the convention at Quicken Loans Arena, Cleveland. Republican National Convention delegates on Wednesday. Melania Trump addresses convention on Monday, the first night, at Cleveland's Quicken Loans Arena. Senator Jeff Sessions and Donald Trump's VP selection, Indiana Gov. Mike Pence, greet each other on Monday night at Quicken Loans Arena. A woman from the anti-war group Code Pink appears in the protest zone outside the convention hall in Cleveland. New Jersey Governor Chris Christie listens to speaker at Quicken Loans Arena on Monday night. A preacher/protester calls on sinners to repent outside the convention in Cleveland. A store window posts political posters in Cleveland during the convention. People protest the Westboro Baptist Church outside the convention hall in Cleveland. Delegates chant, "Send her to jail" Tuesday night at the Republican National Convention. Cleveland police officers observe a protest outside the Quicken Loans Arena. John Lynch, member of RNC's platform committee from Illinois. A Texas delegate Tuesday night at RNC. New Jersey Gov. Chris Christie speaks Tuesday night at RNC. Members of West Virginia delegation at the Quicken Loans Arena Tuesday night. An anti-Trump protester in Cleveland. Protest with signs on ground by members of "We Will Not Be Silent." Nixon operative Roger Stone works his way through crowded streets of Cleveland on Wednesday. Grant Wishard (left), a Republican from Washington, D.C., says he's thinking of voting for Hillary Clinton. Josh Delk (right), a conservative from Philadelphia, says he's dissatisfied with both major candidates and will not vote this year: "I'm going to sit this one out." A police officer photographs protesters outside the convention. Mounted police on loan from Fort Worth, Texas, stand guard at Public Square. Police from 20-plus states have provided additional security for the RNC. Local residents sell Trump merchandise on the streets of Cleveland. A lone protester on the street. Protesters carrying biblical signs shout slogans about how they believe African Americans don't want to work and get more abortions than "any other color of people." NBC's "Meet the Press" moderator Chuck Todd (right), talks on Wednesday with Utah Sen. Mike Lee, who continues to refrain from supporting Donald Trump. Delegates at the RNC Wednesday night. Workers clean up at Quicken Loans Arena at end of convention Thursday night.